*For whatever reason, it seems some enterprising business person is determined to sell their chicken by associating it with Barack Obama. Remember the infamous “Obama Fried Chicken” joint in Brownsville, Brooklyn that opened back in 2009? 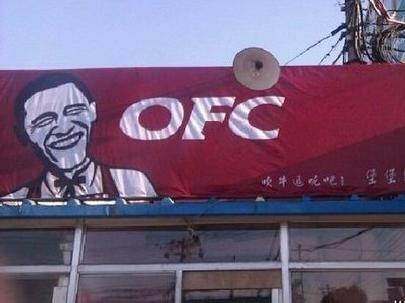 Well jump forward to today and go to Beijing, China and voila, whaddya know, it’s “Obama Fried Chicken” all over again. We guess it should come as no surprise since KFC used an Obama lookalike to pitch it’s chicken in Hong Kong. Uhmmm … So no copyright infringement lawsuit from KFC as yet? They got Obama decked out looking like Colonel Sanders, right down to the pose and smile. Plus KFC vs OFC, same red background. But being in China, can they actually get away with it? Are they even aware of the racist connotations of linking black ppl with fried chicken? And if it came down to enforcing a lawsuit, would the Obama admin intervene by applying pressure. Say trade sanctions. I’m pretty sure Obama would want to do som’n. No president wants to be made out to be a mascot across the world. But then again, Obama is a strange character. Y’all don’t think he would give a fuc? Well now looking at the KFC ad, Obama may not want to have anything to do with them in their pursuance of a lawsuit against OFC. Reported sightings of another Chinese copyright ripoff. Victim: Star Trek. The official Chinese space station logo is a combination of two of Star Trek’s logos. They pretty much took the Starfleet logo and insert it into the United Federation of Planets logo.